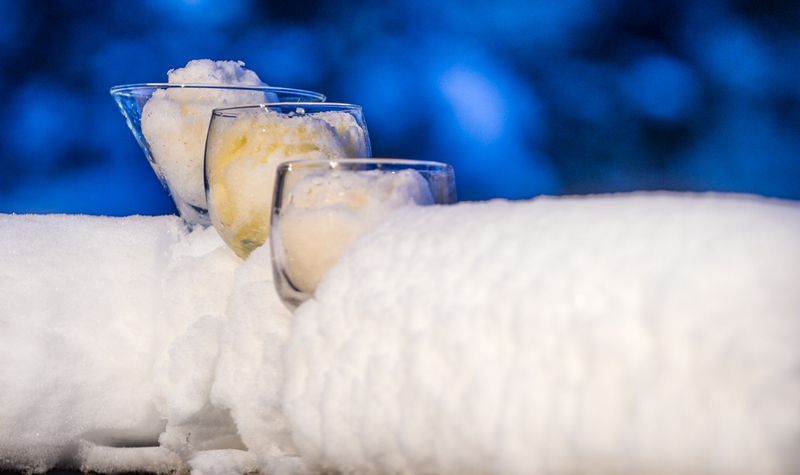 Rosemary Lemonade Snowballs made with fresh fallen snow. From back to front: Rosemary Limonade, Rosemary Citrus & Vanilla Rosemary Lemonade Snowballs. Some of the simplest virgin drinks are lemonades. Creating simple syrups from citrus and herbs, and pouring a tall iced glass full of sweet and tangy refreshment is the classic summer drink. So what to do when it’s blustering on a winter day? Well when they give you lemons, make lemonade. And when they give you mounds of snow, make lemonade snowballs! The three recipes are my favourites from a summer of research in preparation for this blog, each using rosemary as the herbal note in the drink along with either lemon or lime. Each is a intriguing drink as a lemonade, bright tart and delicious, but not too sweet. Cold numbs the taste buds somewhat, so syrups used for snow cones and slushes often have to be slightly more concentrated. I thought it would be fun to see how these lemonade syrups stood up to the snowball test. Each of these syrups I poured over about 1 1/2 cups packed snow to make a 3 inch snowball. The original recipe calls for 1 part syrup to 2 part water or soda water, however for my purposes I poured 2 oz syrup over snowball (yep real fresh clean snow, but you can make this with 1 1/2 cups shaved ice if you don’t have the benefit of freezing cold snowy winters). Mix juice and sugar, heat on medium until sugar dissolved. Add rest, lower to med-low and simmer 1 minute. Remove from heat, let cool overnight then strain and store. The original recipe is very strong and tart. The drink, as the recipe states, has a serious kick which is great for a thirst quencher and for those who like a more sour taste. We tested the drink as directed against the snow ball version, and the snow ball version is less sweet tasting but equally as sour. I tried cutting the syrup half and half with simple syrup for the snowball, which made the result still tart but pleasant and less likely to result in a “pucker power” face. The Kitchen also came up with this recipe using the both oranges and lemons, and blending these with rosemary and honey for a wonderful flavour. The result is a wow factor to the drink that according to the the people at The Kitchen compares in flavour to Orangina. The lemonade recipe calls for 2-3 tbsp syrup poured over ice and filled with water or soda water. When making this up I found that regular stirring was required to keep the syrup from sinking to the bottom of the glass. You can find the original recipe for this Rosmeary Citrus Lemonade here. The authors of The Kitchen mention that this syrup would make a fine granita, which would be a frozen version of the syrup, possibly straight up. So in keeping with the idea of this experiment I poured 2 oz syrup over snowball. Bring to a Boil 1 min, remove from heat and cool 10 min. Strain and store. This recipe as a drink when diluted with water as instructed (1 part syrup to roughly 2 parts water) is very pleasant and the orange juice and additional sweetness the honey provides makes this the sweetest of these three drinks. We found the rosemary quite strong in this blend and if rosemary is not your preferred flavour you may want to reduce the amount in half. 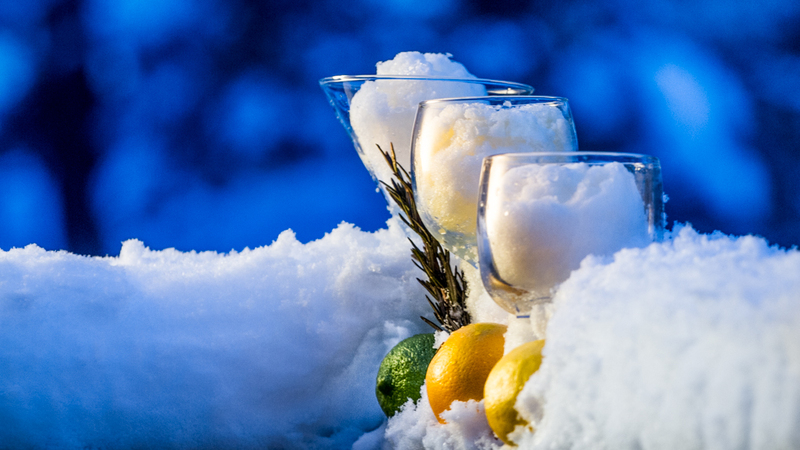 As a snowball, the orange added more colour to the snow than the other two drinks, giving visual appeal, and the snow mixed in to the syrup reduced the sweetness of the drink but not the other flavour profiles. This last recipe was found at MyRecipes.com and is little different in its creation and execution. The syrup for this recipe, unlike the others, doesn’t incorporate the citrus into the mix. Instead the lemon juice is added in equal portion to the syrup as a fresh squeezed component and mixed in glass. You can find the recipe for the original drink here. Because the original drink doesn’t incorporate the lemon I adjusted the concept slightly to make it work for the snow ball. Simmer all but the lemon juice until sugar is dissolved, remove from heat and let cool 30 minutes. Strain. Mix 1 oz fresh squeezed lemon juice with 1 oz syrup in a cocktail shaker. Shake and pour over snowball. Makes about 24 servings. If you are making smaller servings squeeze lemons as you use the syrup and store the remaining syrup without mixing the lemon in. The syrup should last about 1 month in the fridge. This drink is very tart both in the liquid and snowball form. This is probably due to the fresh lemon used with the vanilla rosemary syrup. I found that adding a bit of simple syrup to the drink made a big difference, and would recommend the following formula for the snow if you like things a little sweeter: 1/2 oz lemon juice, 1/2 oz simple syrup, 1 oz vanilla rosemary syrup. For the sake of my tests I wanted clean fresh snow and had to live with what we mostly get: Powder. Great for skiing in, terrible for making snowballs out of. Warming the snow helped, so I left it in a bowl for a day (outside but near the house & covered) and by the next afternoon the snow was perfect for packing. It took about three cups of powder snow to make what would normally amount to one “packed snowball” which required hand packing without mitts (no fluff please!). After freezing my poor fingers, I realized one could pack the snow into a rounded bottomed glass and then simply tip the snowball out into the serving cup… much better, but not quite the same realness. Pouring the syrups over the snow, once it was packed, did not fully saturate the snowball and the result was something that needed to be eaten with a spoon like granita. Stirring the snow up, and giving it a few seconds, allowed the flavour to blend into the snow more uniformly and after a minute or two the drink became, well, more drinkable. Kind of like a daiquiri. So does super cooling the drink make a difference? According to an article in The Guardian the answer is yes. In fact, just as we found, the colder the beverage the sweetness will be less noticeable and the sourness of the drink will be more apparent. This explains why the limeade (which used the least amount of sugar and the strongest juice – 1 cup lime juice) was too strong at full strength, and the rosemary lemonade (where the syrup was diluted with lemon juice) did not taste very sweet, and lost some of it’s more interesting flavours to the cold. These drinks could use something … fancy looking, to add a visual interest. For presentation, these could use something… maybe a swirl of zest on a cocktail stick, a beautiful spoon for stirring, or a citrus wheel. I am hoping that Santa will bring some interesting accessories this year, cause there is not much in the way of local options, and shipping costs are a bit more than this girl can swallow. General Review of idea below! Kid-o-metre 4/5 The concept was super fun too much rosemary was not according to my kids. Taste: 5/5 I made these over and over while we had fresh snow until I ran out of syrup… sometimes we blended syrups for more interesting flavours. Definitely a winter treat! Ingredient finding: 2/5 snow in abundance, rosemary not so much… And in warmer climates… I bet it’s the opposite! Posted on January 3, 2015 December 9, 2014 by orionssong	This entry was posted in Lemonades & Limades, Syrups and Infusions and tagged daquiri, granita, lemon, lime, orange, rosemary. Bookmark the permalink.